In previous years I have forecasted how the MLB season would play out. Some predictions were good (Giants / Tigers World Series last year) some not so much (A's / Rockies in 2011). I've been questioned, mocked and ridiculed but that's not enough for me to stop. Anyhow, this year, I'm going to take a slightly different approach. Instead of predicting exactly where each team will finish, I am going to go with a 75% confidence interval on number of wins per team. I will post my expected win interval for each team along with some other observations before Opening Day. NY Yankees - Their infield DL payroll is higher than several teams' entire payroll. But unlike previous years where the Evil Empire (go ahead and sue me for copyright infringement) would just spend more money on buying some more all-stars, it looks like their opening day lineup may actually include long time Yankee legends such as Eduardo Nunez, Francisco Cervelli and Juan Rivera, as well as the newly added Vernon Wells. This team is really hard to project. If this wasn't the Yankees, they’d be reasonably expected to be a solid 70 win team. But I know better. I have no confidence they are going to stick to their self imposed spending limits for next year. I'll believe it when I see it. My (not-so) bold prediction is that they are going to pay to acquire some much needed pieces and explain that they had to due to all the unexpected injuries. When they do and if all their stars come back healthy and produce, 95 wins is not out of the question. Of course, if they stubbornly refuse to spend and Cano gets injured 70 wins may be a stretch. I have narrowed my guess to a 10 game win interval between 77 and 87 wins. 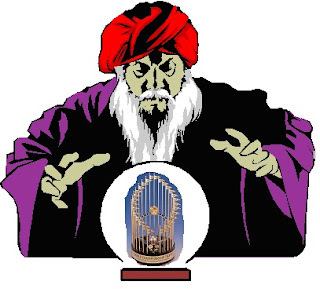 Toronto - Everyone (north of the border anyways) has already anointed them World Series Champions. Well, fellow countrymen, prepare to be disappointed. Poor defense will lead to most of their pitching rotation underperforming. Their bullpen is, um, below average. They will act like they are in playoff contention, being buyers at the deadline but will ultimately fall short at about 85 wins. Having said that, their upside is much higher then their downside, so I have a range of 82-95 for the Jays. LA Angels - Trout will not repeat his rookie campaign. That's not such a tough prediction, because he had one of the best seasons in recent history, matching Ted Williams' best season ever, with his 10.7 bWAR. And I'm also not predicting that he'll go the way of previous ROYs such as Joe Charbonneau who was never heard from again, but I expect merely a very good season from him. A 280/350/475 triple slash line which the LA media will make a big deal about, but is actually very good putting him in Top 20 range for OPS+. But not enough as again the Angels will miss the playoffs, and Mike Scioscia's time in Disneyland might come to an end. I have them between 84 and 90 wins but am also expecting them to be closer to the low range. Philadelphia - This was an old team last year, and their age showed as they stumbled to their worst record in over 10 seasons. Ruben (what a great name!) Amaro Jr got the memo that he was to sign young players and went out and got a couple of them. Unfortunately it seems that there was a misunderstanding. The young guys he signed were Michael and Delmon YOUNG. Michael is 36 years old, and Delmon plays stellar defense... for a DH. Which the Phillies can't use. But this team played great in the 2nd half last year when they were healthy. This year's outcome hinges on Roy Halladay. If he's the Roy of old, he can anchor their rotation to a division title. If he's not then they have some big shoes to fill. I'm picking the Phillies to return to the top of the NL East, predicting 86-96 wins and expecting them to be closer to the top end of that. 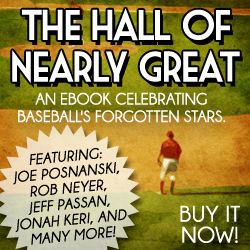 Also, don't forget to pre-order OOTP14 so you can get it before it's released.